For over 30 years, the City has been building City Water Tunnel No. 3. Being built in stages, City Water Tunnel No. 3 is one of the largest capital projects in New York City’s history. Begun in 1970, City Water Tunnel No. 3 will enhance and improve New York City’s water delivery system and create redundancy to allow the City to inspect and repair City Water Tunnels Nos. 1 and 2 for the first time since they were put into service in 1917 and 1936, respectively. The 13-mile Stage 1 section of City Water Tunnel No. 3 went into service in August 1998. It runs from Hillview Reservoir in Yonkers, through the Bronx, down Manhattan across Central Park, and into Astoria, Queens. Stage 2 of City Water Tunnel No. 3 consists of the Manhattan leg and the Brooklyn/Queens leg. Tunneling on the 9-mile Manhattan leg of Stage 2 began in 2003 and was completed in 2008. Since 2008, ten new supply shafts have been constructed that will integrate the new tunnel section with the existing distribution system. The Manhattan leg was activated on October 16, 2013. The Brooklyn/Queens leg is a 5.5-mile section in Brooklyn that connects to a 5-mile section in Queens. 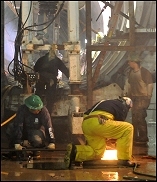 The City completed the Brooklyn/Queens leg of the tunnel in May 2001, and substantially completed the shafts in 2006. The project is scheduled for completion in the 2020s. When activated, the Brooklyn/Queens leg will deliver water to Staten Island, Brooklyn, and Queens.